The NBA 2K League headed to London alongside the NBA for a game in London and brought their flagship Twitch show The Post Up along with them. Check out last week’s review to situate yourself before diving into this week’s. The show featured Wizards District Gaming players Dayfri and DemonJT, who traveled to London alongside their parent organization (who play the New York Knicks in the NBA’s London game at O2 Arena). It also brought in NBA 2K community manager and social media star Ronnie 2K over Skype, hosted British NBA 2K League player Hazzaa_Hurst on-set and showed a league-focused Q & A of Washington’s Zachary Leonsis. The league had only one week between the previous show and this week’s, and the production team hardly had their standard resources with them. Consequently, we’ll forgive the smaller issues, such as occasional scratchy audio; the show did, however, fix some previous small issues: they remembered to turn off in-game audio during the “All About the Game” and “The Scrimmage” segments. But you know what? This show worked really well. It focused on the team’s travel and the players’ new experiences in the United Kingdom as a whole. That makes the live show itself more entertaining and engaging, since it offers fans a look into the incredible trip that they wouldn’t otherwise get. It also enlivens the breaks (which are still too long and too frequent, but again, we’ll give that a pass this week) by providing new and thematic content. New and thematic content is an imperative and the path to success. The unique variety of the location and trip strengthened the segments themselves. While the First Shake duo of Comp and Frank didn’t make the trip, the show brought in season one (Mavs Gaming) player Harry “Hazzaa” Hurst for a majority of the episode. 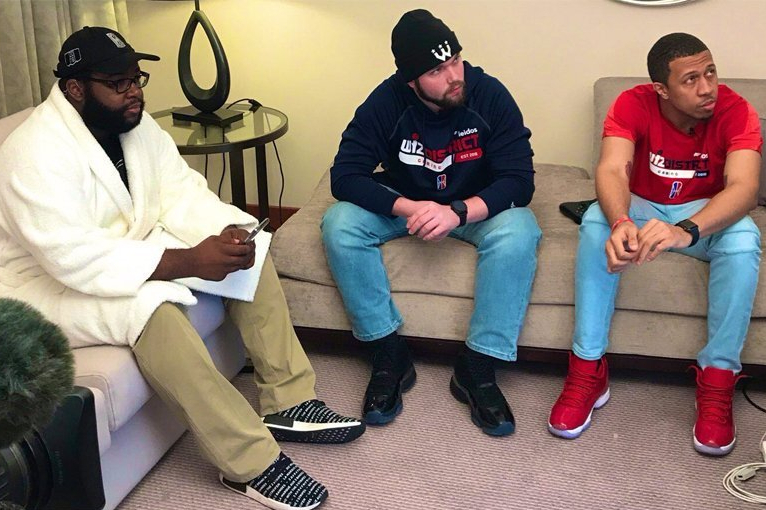 The NBA 2K Lifestyle segment was in particular a real strength of the episode, as Phil and the three players were tasked with guessing the cockney rhyming scheme of various specifically English phrases. Ronnie 2K skyped in for his take on the league, too, perhaps an interesting episode in which to do so. Hazzaa, Dayfri, and DemonJT all spoke very well and fluidly, which hasn’t always been a constant on the show. Hazzaa offered an enlightening look at the Britain/European Pro-Am competitive scene and the state of esports in the British Isles as a whole. The new Wiz DG teammates showed glimpses of really good and easygoing chemistry while speaking authentically about their enjoyment and experience of London. Phil, suitably donning a hotel bathrobe, did very well hosting a relaxed, vacation-style episode. Viewership struggled, mainly due to the episode taking place at noon EST (5 p.m. in London). The episode maxed out at 294 concurrent viewers and pulled in 962 unique viewers, with the league Twitch channel gaining 15 more followers. That doesn’t detract from the positive qualities of the episode, with the successful aspects implemented in this episode outweighing the low numbers of an unavoidably detrimental start time. We’ll see what the league takes away from this as they continue to transition to the Matt Arden era. Expect some changes for the next episode back in New York, especially as the draft draws nearer.